In 12-inch nonstick skillet, heat oil over medium heat. Add shrimp; cook 2 to 3 minutes, stirring frequently, until pink. Remove shrimp from pan to small bowl. Cover to keep warm; set aside. Add white parts of green onion and chili garlic sauce to skillet; cook 30 seconds. Add tomatoes and water; increase heat to high. Heat to boiling. Add spaghetti; return to boiling, stirring constantly to prevent noodles from sticking together. Reduce heat to low. Cook, stirring frequently, 13 to 15 minutes or until pasta is tender. Stir in shrimp and baby greens; cook about 30 seconds or until shrimp is heated through and greens are slightly wilted. Remove from heat; stir in lemon juice. Top with remaining green onion. Keep that spoon moving! Stirring often is the key to success with this recipe. Cutting shrimp in half lengthwise may seem odd, but it stretches the amount of shrimp and makes each serving look a bit more robust. 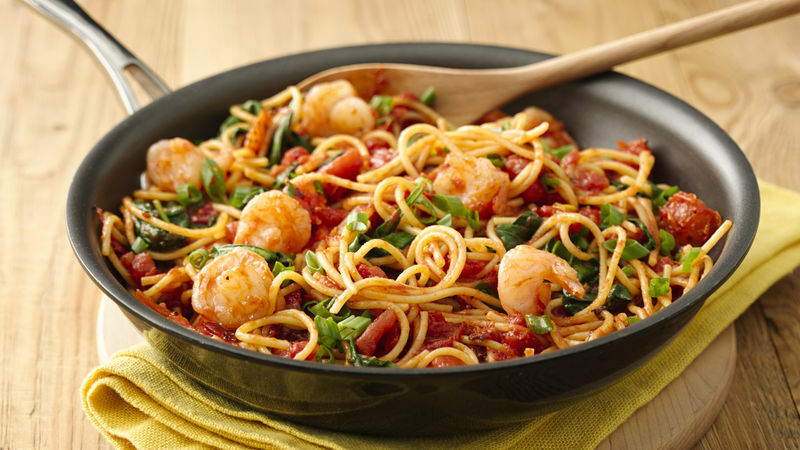 Make a healthful shrimp and pasta dish all in one pan in less than 30 minutes with this delicious, colorful dish. This recipe makes enough for 2 with leftovers.